Self Guided Adventure Travel Overview! 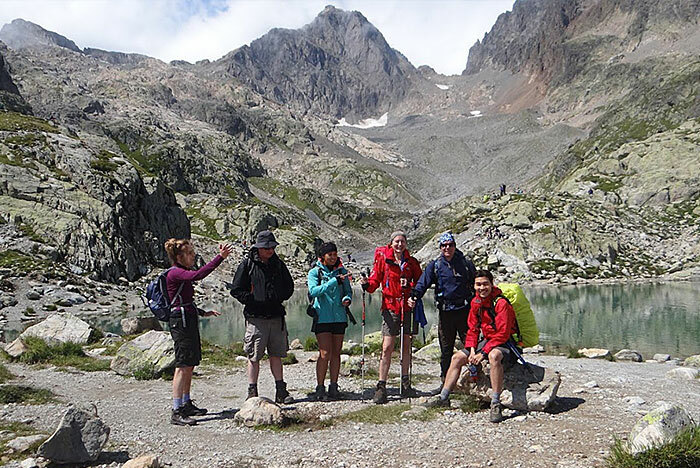 On this page you can find out about our Mont Blanc self guided walks for trekking around TMB. You have the option to travel clockwise, anti clockwise, do a half tour (in either direction) or mix the itinerary so that you can take extra breaks on route to explore some area’s a little bit more. The perfect adventure travel holiday for 2 or more people! We offer competitive pricing for all budgets and accommodation needs, from huts to hotels! So please, browse the page and start planning your next adventure today! This is an exciting adventure travel holiday. The route plan below our BASIC itinerary, completing the Tour in 11 days, clockwise, starting and finishing in Chamonix, France. 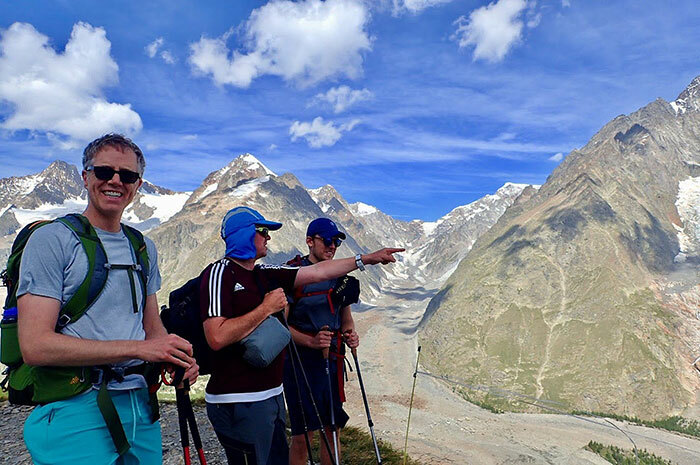 If you would like a rest day in Courmayeur, Italy, you should book the BASIC 14 day tour. We walk through the old village of Argentiere and up to Montroc. A steady climb through the Pine forest rewards us with a view of Le Tour, and the Le Tour glacier. After a coffee break in one of the ‘Alpage’s’ we continue up to the Col du Balme refuge, the border with Switzerland. After lunch, spent gazing down the length of the Chamonix valley, we continue up for about 30 minutes to the Tete de Balme 2,321m. Beyond, our descent begins through Alpine pastures, inhabited by grazing cattle, giving way to the pine forests before arriving in Trient. A final short climb brings us to the Col du Forclaz and your hotel. Distance 9 Kilometres and 1200 metres ascent/1100m descent. 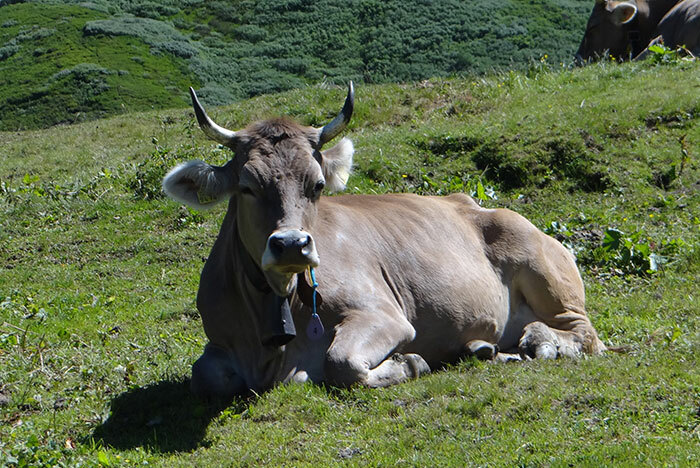 The Bovine Route (800 metre ascent, 6 hrs) with a lunch stop at the ‘Alpage’, is the easier option. Alternatively, if the weather is suitable and you are feeling strong, there is the Finetre d’Arpette (1200m, 8 hrs) with its glacial views. Either route ends in Champex Lac. An easier day with an initial drop through forests to the valley floor. The afternoon is spent on an easy incline following the valley up through a series of farming villages, over a long extinct terminal moraine and narrow paths above the river to arrive in the small resort of La Fouly. Follow the traditional TMB route, up into a rock amphitheatre before climbing to the Col Sapin. This place is very special to me, the one place on the TMB where you will find the ‘Stella Alpina’ (Eidelweiss) growing in it’s natural environment on the rocky mountainside. We descend through forests, passing donkeys, goats and sheep before arriving in Courmayeur. 12km, 800m ascent/1400m descent. 6.5 hrs. Climbing above the Val Veny, offers fantastic close up views of Mont Blanc and the glaciere Miage below. 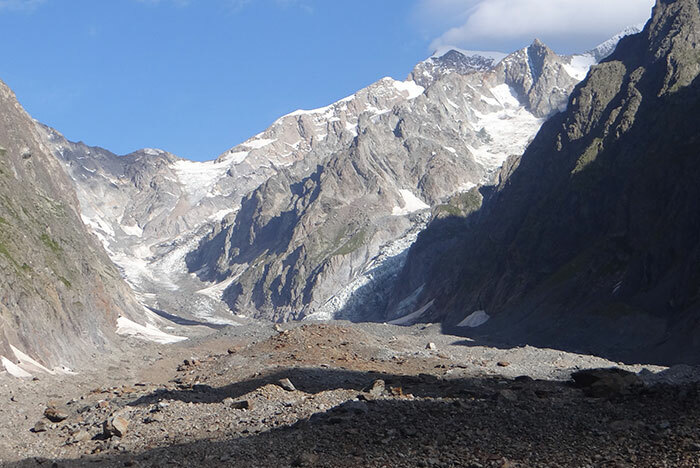 We drop into the Val Veny before following the main path past the Miage glacier. A final 200 metre ascent brings us to the Rifugio Elizabetta 1100m climb/300m decent. 5 hrs. The day begins with a climb to the Col du Seine, the border with France. We then descend to the Refuge Mottets before beginning a steady climb to the Col du Fours. Many times I’ve seen Ibex on this relatively quiet section, I hope you do too. From the Col, the joint highest point on the circuit, we are only 25 minutes from the Refuge Croix du Col du Bonhomme. 14.5 km, 1135m ascent/700m descent. 8 hrs. The morning is spent on a long but easy descent, passing several refuges on route where you can get coffee. Continuing along the valley to the village of Contamines. After, begins a climb through the forest before emerging onto a small plateau and the Chalet. 17.5 km, 500m ascent, 7 hrs. Descend to the Chelet Miage, 45 minutes. Then a 500 metre climb to the Col du Tricot. After there is an easier descent, then a wire bridge crossing of the Bonassey glacier outflow. An easy and steady ascent brings you to the Col du Vosa and part of the cog railway that runs down to St Gervais. From here we descend into the village of Les Houche. 10km, 650m ascent. 5 hours with stops. Today a grand ascent that will once again bring us to the Plan Praz Cable car, via Brevent, and some stunning views of the Bossons Glacier as well as the Aiguille du Midi, Mont Maudit, Mont Blanc du Tacal and Mont Blanc. A great place to picnic! After lunch we continue over Brevent and down to Plan Praz. Use the return portion of your ticket to descend into Chamonix and return to the Hotel Richmonde for the final night. 12km, 1550m ascent/500m descent. 7 hrs. You’ve reached the end of your Mont Blanc self guided walk. If you are traveling as a couple or family of 4,6 or 8 there are limited private rooms available in some huts. Please ask prior to booking if you would prefer this option (subject to availability and additional costs of around 10-15 euro per person per night). The self guided walks run any time from June-September available during any day of the week. How experienced do I need to be to undertake a self guided walk? Do you know what map orientation is? Can you orientate the map using the compass? Are you confident in ‘interpreting’ the features on the map? Examples could be a path, a stream junctions, a col, rock outcrops and cliffs. Can you visualise what contour lines on the map, look like on the ground? Examples might be concave or convex slopes. How steep you would expect them to be? (the closer together the contour lines are, the steeper the slope). Can you identify a path that you want to follow and take a compass bearing from the map, in order to point the way? If the answer is yes, then I am sure you will be able to extract yourself from a situation where the weather has closed in and visibility has been reduced. If you answered no to some of the questions, see below. What level of involvement does this trip offer? When using the supplied map and trip notes, a self guided trip offers the excitement of exploration in unfamiliar territory. However, once you hit the higher remote mountainside on each day of the tour, you may still require the use of a map and compass. If you are unfortunate enough to experience a day when the rain is horizontal or mist/low cloud obscures the view or even the path (they are fairly rare). Having guided this route more than a dozen times in the last four years, I have on many occasions been asked by lone walkers or small groups in remote places for confirmation that they are going the right way. I would rather you didn’t get to this stage! When it comes down to it, trip notes will become an AID to navigation in bad visibility. To see the whole picture you still need to be able to read a map and navigate with it. I’m not sure I am experienced enough. What is the alternative? If you were not so confident in your answers then why not take a short navigation course with ‘Alpine Walks’ to brush up your skills? ​We can arrange a one or two day course in the United Kingdom or in Chamonix, France, prior to the start of your trips. Contact us for more information. Part of the self guided booking conditions include a declaration that you can answer yes to all of the above questions, so if this isn’t for you, why not consider a guided tour instead? Alpine Walk’s self guided walking tours are all about the personal touch. We will plan your journey along a range of different routes that provide different challenges based on what you want from your walking break. Do you want the best views? Do you want the chance to experience some of the local wildlife? The Fenetre D’Arpette, 2665 metres, is the joint highest point of the TMB (Shared with the Col du Fours, in France). It is one of the ‘Varient’ routes, is challenging in its remoteness, lacks water stops on hot days and you need to cross a ‘boulder field’ on route to the summit. It should also be avoided in anything other than good weather conditions for the entire day. Having said that, it offers fantastic views of the Trient glacier outflow and views of the French/Swiss Mountain border and Lac Emotion. You are also likely to have the company of Alpine Choughs on the summit (thats the black, crow sized bird with bright yellow beak and legs, sometimes they are orange, that makes a distinct ‘cackle as it circles the surrounding rock faces). Distance 7.1 Kilometres (KM), Total height gain 1,179 metres, Total time: 4 25 * (Time does not include stops). From outside the front door of the hotel, turn right and follow the road away from the Lac, up the hill, passing the bakery, adorned with flower baskets. Continue along the road after the bakery for 600m, until you see the road take a steep left hand bend. Make sure you are on the left hand side of the road, behind the metal barrier (an arrow painted on the barrier suggests this for pedestrians as there is no pavement). Follow this round until the main road bends 90 degrees right. Here there is a signpost next to a minor road going uphill, signposted ‘Relais D’Arpette’. If you were to continue on the main road you would see the chair lift station, set back from the road on the left hand side, in approximately 50 metres. Follow the minor tarmac road up between forest on left and right hand side. After 150 metres you’ll see a small stream passing under the road. This is known as a Bisse is Switzerland – a man made stream origionally used to channel water around the mountains to feed different farms. You can turn right and follow the stream-side path. Keep next to the stream for 1.2 km until you cross a wooden bridge over a torrent of water. After crossing the bridge, turn left and follow the path uphill until you arrive on a four wheel drive track next to a vehicle bridge over the torrent.Recross the river and on the right hand side of the track the path continues adjacent to the river. Follow this path up and you’ll come out onto a tarmac minor road. 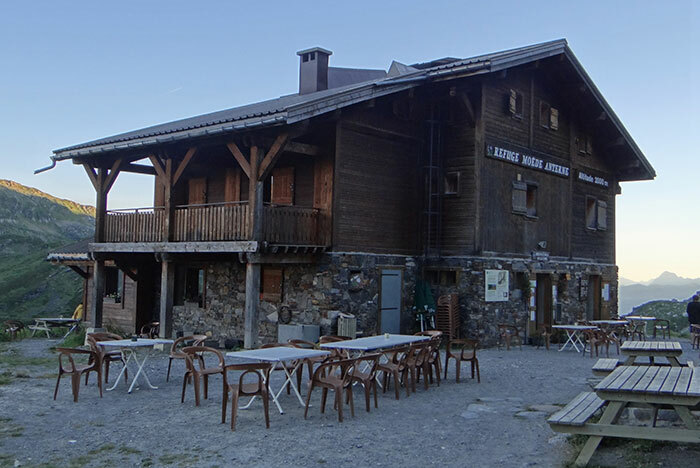 Walk up the road for 400m and you’ll arrive at the ‘Relais D’Arpette’ refuge/cafe on the right hand side. Continue on the tarmac road, ignore the left turn in 50 metres, follow the road to the right and stay on it all the way to the ‘Relais D’Arpette’ refuge/cafe. This cafe is the only place to get further refreshment until you return or descend a good way down the far side of the mountain to Trient. You are strongly advised to hydrate here and make sure you have 2 litres of water for your onward journey. You will cross the stream further up – its glacial outflow is not healthy to drink owing to the silt etc in it. From the Relais D’Arpette the road continues up the Val D’Arpette, the right gets you to a collection of wooden chalets. The left side is now a pleasant meadow. A further 200m brings you to a collection of wooden chalets. Here the tarmac road ends but a four wheel drive track continues. Follow this track (the meadow is now predominantly on your left) for 700 metres (around 18 minutes, allowing for the extra 30m height gain). At this point the track starts to turn to the left and there is a path that looks as if its going into the woods. The boulder field is marked on your map, where the solid red line of the TMB route becomes a series of red dotes, denoting a change in route from ‘Signposted route’ to ‘Hardpart of route’. Continue following the path, occasionally marked by red and white dashes of paint on rocks (the pan European symbol for a footpath). You should be continuing to climb to the righthand side of the valley floor and will be ascending above it quite quickly. There are a couple of small switch backs as you climb but with this slight change is direction, if there is no mist or low cloud, you should now see the Fenetre Arpette coming into view as the lowest point on a jagged skyline ahead of you. After around 55 minutes you should arrive on a small flat area where the path fades out and is replaced by a jumbling mass of boulders! The boulder field is relatively stable and the best way to cross it is just to focus on spotting the red/white markers painted onto the rocks. They are not more than about 20 metres apart. Just concentrate on looking for the nearest marker and don’t try to cut corners. The route generally moves west across the boulder field, climbing steadily. Expect to go slowly across this section and don’t try to rush it. DO NOT cross this area if a thunderstorm is imminent in the immediate vicinity. Ground lightening strikes spark and ‘travel’ across the gaps between rock. If you are unfortunate enough to be caught out, take off your pack and sit on it to isolate yourself from the ground and wait it out. Place trekking poles on the ground next to you – do not continue to hold them. Under no circumstances shelter under large boulders as the spark from the lightening strike travels. Once across the boulder field pick the easiest path on the very steep final ascent to the Col.
Congratulations on reaching the Fenetre D’Arpette, enjoy the views, you’ve earned it!